If you enjoy watching expert equestrian riders, amazing (but also controversial) bullfighters, flamenco dancers and huge parties, the Feria will definitely not disappoint you! 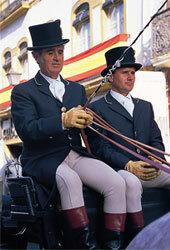 The Seville April Fair (Feria de Abril) is held this week in Seville, Andalusia. This year we see it taking place from 16th to 21st April, two weeks after Easter Holy Week (Semana Santa de Sevilla). Officially, this year’s amazing fiesta began on Monday at midnight with the prueba del alumbrado (lighting test), in which thousands of colored light bulbs were lit around the main gate of the city. The Feria will run for six days and starts with a parade of flower decorated carriages with expert riders, carrying Sevillian dignitaries through the city towards the Spain’s oldest and most unforgiving bullring (La Real Maestranza). 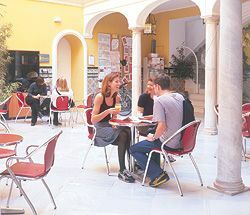 Studying Spanish in Seville was the experience of a lifetime! What an unbelievable city with stunning landscapes, glorious weather, and a new adventure around every corner. 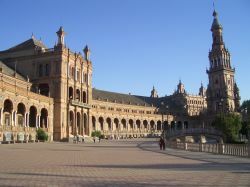 I just returned from Seville and I would recommend it to anyone looking for a true Spanish cultural experience! My sightseeing journey around Seville began with the impressive Cathedral, which is the third largest in the world (after St. Peter’s in Vatican City and St. Paul’s in London)! I didn’t want to settle for a picture from below so I decided to climb the ramp to the bell tower, La Giralda, to capture the essence of this architectural brilliance. From here, I got a breathtaking view of the city and of the Cathedral. Looking below I could see the magnificent Gothic-style buttresses surrounding the tranquil Patio of Orange Trees (El Patio de los Naranjos). Capturing the view of the citrusy, sunny glow shining upon the courtyard was well worth the climb and the sound of the huge bells unexpectedly ringing in my ears! Discover the magic of Isla Magica, Seville! I had a great time during my spanish course in Seville, especially during the weekend my family came to visit me! After the classes, the school always organised something so we could get to know the city and all the great things it has to offer! It was March, but it was already extremely hot in Seville and my family, my parents and my grandparents decided to visit me for the weekend. They were quite impressed when they heard me speaking Spanish! 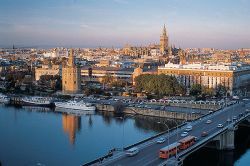 I believe that the closest to the most “Spanish” experience you can get is to spend a lengthy period of time in Seville, the heart of Andalucía. I went to this gorgeous city to study a language course, and I ended up staying there for almost a year because I fell in love with the place. I had the chance to find a place to stay in the historic quarter of Santa Cruz, right next to the famous cathedral La Giralda in the city centre. It certainly gave a special romantic feeling passing by this enormous amazing building while hearing the sound of the cathedral bells and the clippety-clops of the horse hooves on the stone every morning. The calm River Gualadquivir runs slowly through the city, and you usually can find young people sitting in the grass, playing the guitar and looking at the view. On the other side of the river you find the Triana quarter where there are charming narrow streets filled with traditional ceramic factories and typical Andalucian tapas bars.